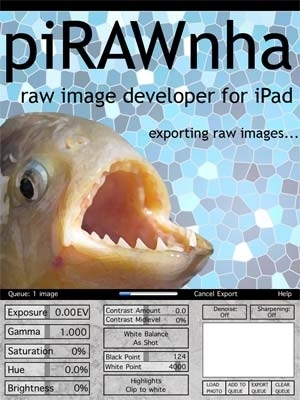 "piRAWnha is the first RAW image developer for the iPad. In piRAWnha, the raw data can be edited and once the settings have been optimized, a high‐quality JPEG image file can be exported to the Photo Library. Currently, piRAWnha supports raw images transferred to the iPad with the Apple iPad Camera Connection Kit. piRAWnha works with all raw files supported by Apple." The iPad's IPS screen makes it a natural fit in the photographer's bag. Upon the iPad's announcement most photographers saw its potential as a portable electronic portfolio. Others have since used it for a second monitor for photo editing on the notebook while out in the field. Now there is an app to process raw images on the iPad. Besides the awful pun, I am just curious if anyone would really want to use the iPad to process anywhere from 12 megapixel to 24 megapixel raw images.